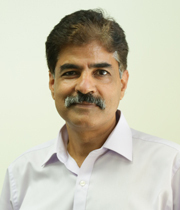 Pankaj Jalote is currently a Distinguished Professor (CSE). He was the founding Director of IIIT-Delhi from 2008-2018. Earlier, he has also been an Assistant Professor at University of Maryland College Park, Professor and Head of Computer Science Department at IIT Kanpur, and Chair Professor at IIT Delhi, . He has also been Vice President at Infosys for 2 years, Visiting Researcher at Microsoft in Redmond for 1 year, and Interim Vice Chancellor of Delhi Technological University (DTU) for six months. He has a B.Tech. from IIT Kanpur, MS from Pennsylvania State University, and Ph.D. from University of Illinois at Urbana-Champaign. He is the author of five books, some of which have been translated in Chinese, Japanese, Korean etc, and the Indian edition of his text on Software Engineering was adjudged the bestselling book by the publisher. His main area of interest is Software Engineering and Higher Education. He has served on the editorial boards of IEEE Transactions on Software Engineering, Intl. Journal on Empirical Software Engineering, and IEEE Trans. on Services Computing. He is a Fellow of the IEEE and INAE. Software quality, process improvement, Higher Education in India. Software Engineering, Quantitative Methods in Software Engineering, E-Commerce, Effective Teaching, Technical Communication.